When the family unit arrests are added to other categories — single adults and unaccompanied minors — the total number of people caught trying to cross the southwest border illegally in October was about 51,000, or 1,700 per day. That means the number of migrants arrested along the southwest border in an average week — 11,900 — is about three times as many people traveling in the highly publicized caravan. Put differently, the equivalent of about 13 caravans is caught after crossing the border illegally every month. Historically speaking, illegal immigration remains well below numbers seen at the turn of the century, when border authorities were regularly arresting more than 1 million migrants per year. While overall arrests have declined since then, the demographics of illegal immigration have changed in ways that make it harder for the system to absorb the latest wave of migrants. In 2000, more than 95 percent of border arrests were Mexican nationals, mostly single men looking for work. Today, migrants from Central America have surpassed Mexicans as the majority of illegal border-crossers — 56 percent of CBP arrests at the southwest border in FY2018 were of Central Americans. Family units and unaccompanied minors accounted for about half of the arrests within the Central American group, meaning about a quarter of all border apprehensions triggered special detention procedures required by law for migrant families and children. These complicated cases have outstripped the government’s limited detention space for families, so most of them are released pending an immigration court date months in the future. As the demographics of illegal immigration have changed, so has the aim of the migrants themselves. Until recent years, most migrants arrested at the border were men who were obviously looking for work, often in agriculture or construction. 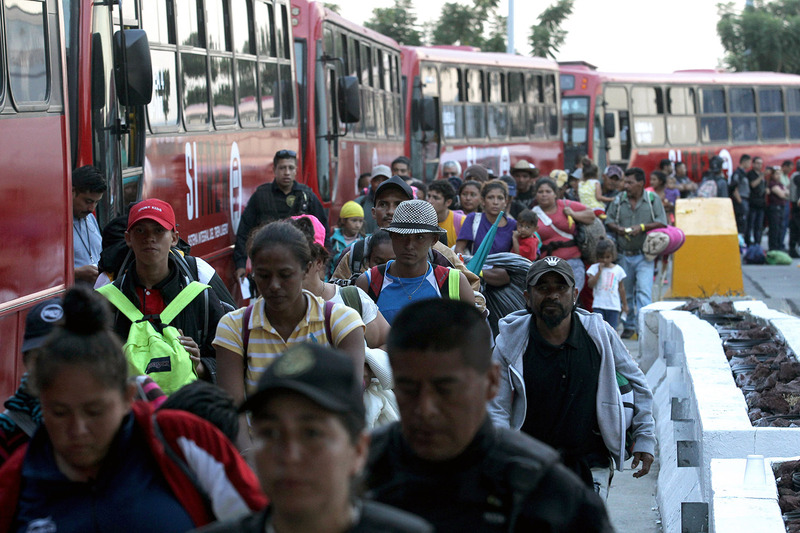 Today, there are economic migrants among those in the caravan and among Central American migrants more broadly, but just as often the people crossing the southwest border illegally are asylum seekers. And unlike previous waves of illegal immigrants, many aren’t trying to avoid arrest by the Border Patrol — they want to turn themselves into federal authorities at first chance. That’s because, under U.S. law, a person can petition for asylum as long as he is in U.S. territory, regardless of how he got there. When a migrant claims “credible fear” of being persecuted in his home country, the arresting agent must refer him to an asylum officer for screening. The Trump administration contends that this arrangement leads to abuse of the asylum system by meritless applicants. As evidence, it has pointed to the wide disparity between credible fear pass rates and successful asylum determinations for Central American applicants. In FY2018, 89 percent of migrants from Guatemala, Honduras and El Salvador received a positive credible fear interview, but only 9 percent of those who were referred to an immigration judge ultimately received asylum. The White House has called on lawmakers to change immigration laws to make it easier to detain families together and raise the bar for a credible fear determination, but those policy recommendations face insurmountable opposition in Congress. As a result, the administration has moved to change asylum polices via regulation — most recently on Friday, when Trump issued a proclamation making most migrants who illegally cross the border ineligible for asylum. The ACLU and other groups challenged the order almost immediately, asking the U.S. District Court for the District of Northern California for a nationwide injunction. A judge has yet to rule on the motion.